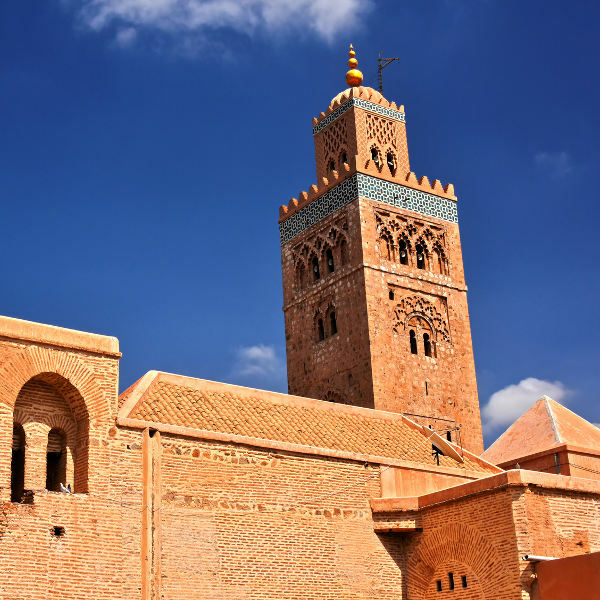 Seeped in old-world charm and home to the Amazigh tribes, Marrakech is the symbol of Morocco. Once a ruined city, Marrakech is now home to a population of approximately 1 million warm and welcoming people, and one of the four Imperial Cities of Morocco. Attractions include Jemaa el-Fna, Koutoubia Mosque, Saaidian Tombs and Almoravid Koubba. Lose yourself in a world snake of charmers, ornate palaces trimmed with gold, and North African charm with cheap flights to Marrakech! Exquisite architectural artistry awaits, carved into the minaret of Koutoubia Mosque, etched into the cedar wood of Ben Youssef Madrasa and sculpted into the dome of Almoravid Koubba. From the spice sellers and intricate hand woven rugs, to the ochre ramparts and amber hues that coat the city at dawn, Marrakech is a kaleidoscope of colour. 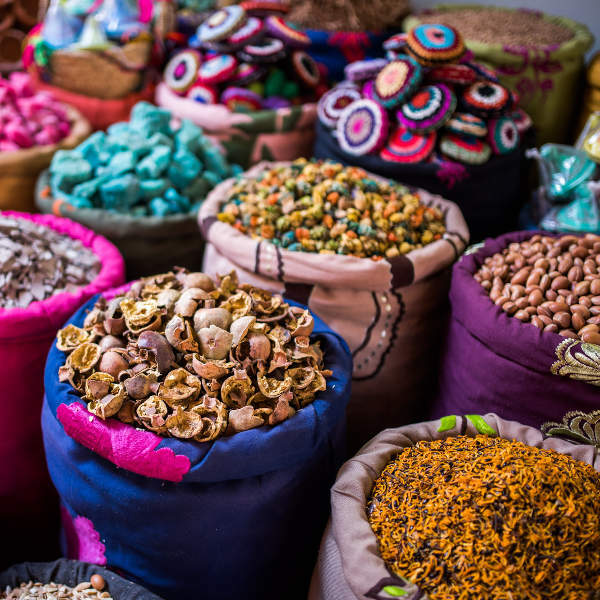 African voodoo ingredients, Gnaoua music, tea drinking, snake charming, ancient Islamic scriptures, sacred tombs, dishes of steaming tajine. Culture abounds, seeped into the ochre walls and cobbled alleyways. Although Marrakech experiences searing heat and fierce sandstorms, rainfall occasionally suffuses the landscape, drawing blooming patches and strokes of emerald from the earth. Giant bamboos, yuccas, papyrus and fragrant trees such as pomegranate, banana, fig and olive all thrive in this oasis. The spring (March to May) and autumn (September to November) months are best for witnessing this bloom of rich plant life and curious colour in Marrakech. Temperatures are also less suffocating. Summer (June to August) in Marrakech is intense, with temperatures often soaring into the 40 degrees Celsius region. Summer means blazing skies and peak season, but also sees performers and entertainers sauntering into town for the breathtaking Popular Arts Festival. 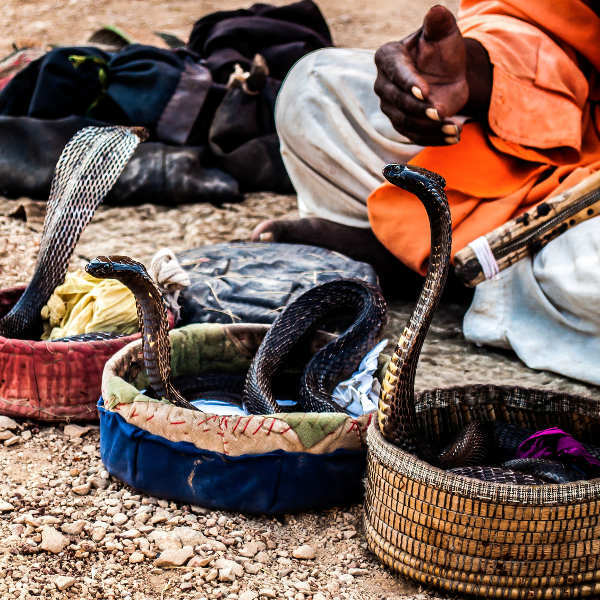 Be awed by Berber musicians and dancers, Gnaouas drummers, Andalucían-style songsters, fire swallowers, acrobats, folk singers, snake charmers, fortune tellers and Arabian horses. Sunken into the blistering sands of Morocco lies a place that glimmers and glows, whispering tales of mystical lanterns owned by Moroccan genies, Sufi brotherhoods and magic carpets. This is Marrakech – a place where cobbled alleyways lead to secret courtyards, and the mystery and magic of ancient cultures breathes into your ear while you wander through saffron scented streets. 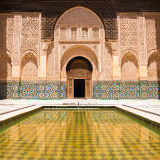 A journey to Marrakech is unlike anything you could ever imagine. Built by Moroccan Berber empires, ruled by wealthy sultans and visited by many Sufi pilgrims, Marrakech is a sacred cultural and religious oasis. Sprawling souqs tremble with the hustle and bustle of spice merchants, monkeys and their masters, and street performers plucking at the strings of delicately carved lutes. Hidden away from the chaos of the medina, gleaming religious sites and opulent palaces adorned with beautiful mosaics and intricate carvings laze quietly in sacred tranquility. Get lost in turmeric and rouge hues, wander down unmarked streets and disappear into a world that brims with culture, flavour and the divine touch of a city soaked in history. 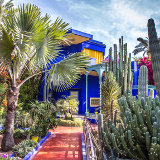 Compare several airlines, and book your cheap flights to Marrakech online with Travelstart! Marrakech is considered a relatively safe city. However, there are a number of precautions that apply when travelling to an unfamiliar place. Travel insurance to cover theft and medical expenses is highly recommended. Remain vigilant in large crowds (especially market places) and avoid carrying large sums of cash, important documents, and valuables, as pick-pocketing and bag snatching does happen. Although Marrakech is largely unaffected by terrorism, it does form part of West Africa, so caution is advised. It is best to avoid establishments associated with the US and ‘Western’ cultural or economic interests. Women should remain vigilant when travelling alone, and avoid walking around alone at night. Be wary of scams and touting. Seek advice before travelling to desert areas. Four-wheel drive vehicles are required when venturing into the mountainous or desert areas. When buying street food, ensure it is freshly prepared. Food that has been sitting in the sun for hours can wreak havoc on digestive systems that are sensitive or unaccustomed to these new conditions. Tap water in Marrakech should be filtered or boiled first. Buying bottled water is recommended. Avoid swimming in fresh bodies of water, as Bilharzia is present in Morocco. Snails sold by vendors should also be avoided. Vaccinations for hepatitis A and B, MMR, typhoid, rabies and tetanus are recommended. Accommodation in Marrakech is an amalgam of traditional riads and kasbahs, and contemporary boutique hotels and luxurious maison d’Hotes. 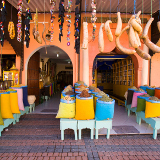 When it comes to accommodation in Marrakech there are two clearly defined options. In the heart of the medina, amidst the chaos and noise, or away from the hubbub, in a more reserved part of town. Of course this also defines your experience in Marrakech. For a truly authentic experience, riads and kasbahs are historical homes, once belonging to merchants or noblemen, which are now magnificently restored buildings with devastatingly beautiful interiors. The grandiose interiors reflect the trademark decadence of Morocco, contrasting wonderfully with their entrances - shabby nondescript doors gazing out modestly onto the mayhem of the medina. For a sleeker experience with a touch of French pizazz, the Gueliz district offers a more refined atmosphere with its boutique hotels, array of evening activities and contemporary dining options. Extravagance abounds, with hotels offering Western facilities and lavish interiors. Getting from the airport to the medina, tourist areas or hotels can be done by taxi or bus. There are several bus lines which drop off at various locations around the city. Buses arrive approximately every 30 minutes from 06.15 to 21.45. Taxis are also abundant but require some negotiation on fare. Buses and taxis can also be used for travelling within and around the city. Calèches are horse-drawn carriages that provide an excellent way of seeing the city. They can be found congregating at the Square de Foucauld near the Djemma el Fna. State-fixed rates apply, but agreeing on a price beforehand is recommended. City Sightseeing Bus is also available from the Square de Foucauld and travels around the outskirts of the city. Tickets are valid for 24 hours, but buses stop running quite early, so the morning tours are recommended. For something less formal, bicycle hire is a thrilling and easy way to explore the city.